The upper courses of this brick wall, which fronts the garden of Wheathampstead Place, are Victorian but the lower courses are 16th century Elizabethan. The top of the wall has a dog-tooth dentil course with tiled coping. 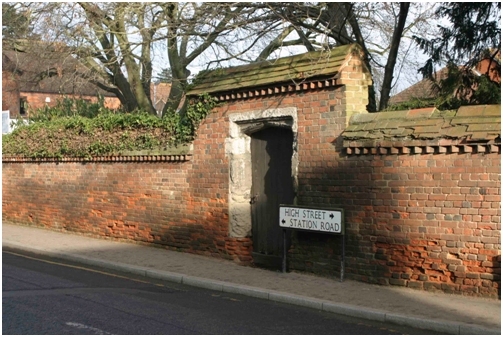 The dentil style has been reproduced in walls in the new housing estate that centres on Waddling Lane. Set into the wall is a 16th century stone arch made from Reigate Stone. It has a flattened four-centre head set in a square surround.